When asked to select the platform, select "Windows" and not "Windows x64" because we want the 32 bit software and not the 64 bit one eventhough our OS is 64 bit. No special installation instruction, just keep clicking next on the installation wizard dialog boxes that pop up. Use the 32 bit Eclipse eventhough your OS is 64 bit. Rename this "eclipse" folder to "eclipseandroid" in case you want to distinguish it from other installations of eclipse. Rename the workspace path from "C:\Users\Anurag Chugh\workspace" to "C:\Users\Anurag Chugh\androidworkspace" and before pressing "OK" check the box "Use this as the default and do not ask again"
Close Eclipse. Check the box "Always exit without prompt" before pressing "OK"
Install installer_r08-windows.exe. No special installation instruction, just keep clicking next on the installation wizard dialog boxes that pop up. At the end uncheck the box to prevent running the "SDK Manager" before clicking Finish. Create shortcut to "C:\eclipseandroid\eclipse.exe" on the Desktop and name it "Eclipse - Android"
Start Eclipse using shortcut placed on the desktop and go to Workbench. Click on "Help > Install New Software" . Click "Archive" and browse to point to "ADT-8.0.1.zip" and install everything related to Android. You will have to accept the license agreement before proceeding. Restart Eclipse when asked to do so. From "Start Menu", right click "SDK Manager" listed under "Android SDK Tools" and click "Run as Administrator". Within SDK Manager, go to Virtual devices and create a new "Android 2.3 - Level 9" Virtual device named "A2.3L9Hello". Set SD card Size to 64 MiB. Close the SDK Manager. Browse for SDK location and make it point to "C:\Program Files (x86)\Android\android-sdk-windows" and click Apply. Click OK and come out of the preferences. Select "Android Project" and click next. When asked for a way to run the application select "Android Application"
Whe asked to "Save Changes" click "Yes"
Virtual device will boot up (takes lots of time). First textual animation appears and then Graphical Animation appears. 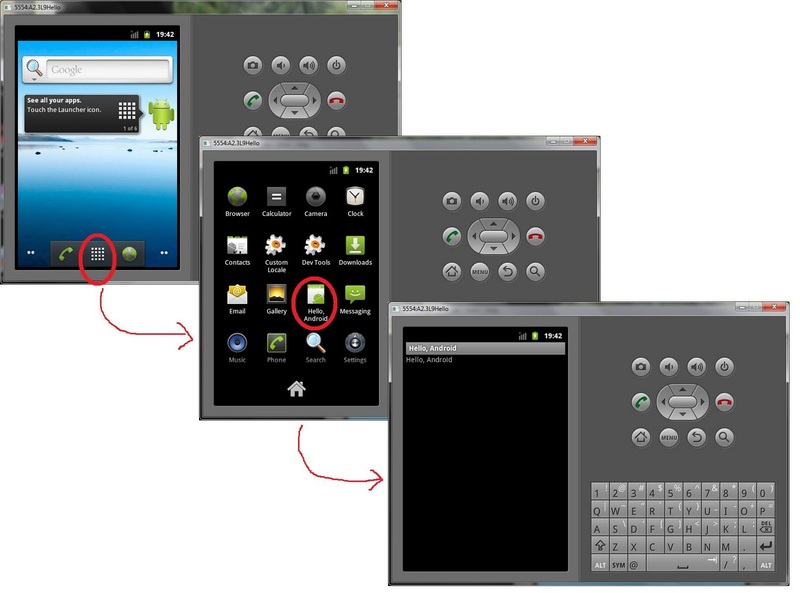 When the home screen appears, the application will run and display "Hello Android". If it doesn't press the launcher icon on the screen (one with the small square grid on it) and run the "Hello, Android" application by click on its icon.